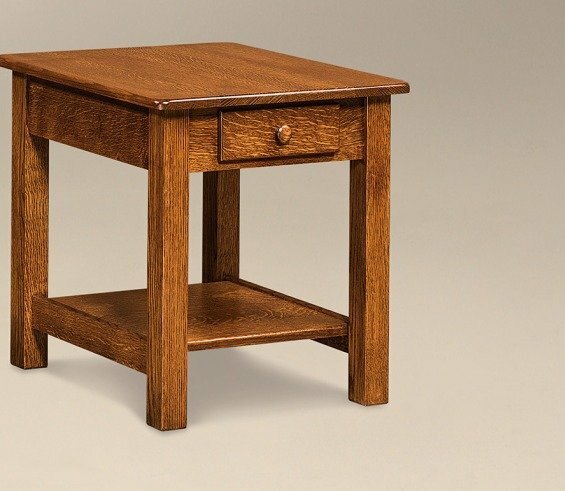 Our Amish 22" Contemporary End Table is all about clean lines and functionality. Measuring 22w x 24d x 24h, this open contemporary mission-style accent table features a solid top with round edges, four square legs, a drawer and shelf close to the base. The clean design will pair well with a variety of furniture styles, while offering a spot for a lamp, books, framed photos, coasters and drinks next to the sofa. Choose from a variety of wood, finish, and hardware options to make it yours.